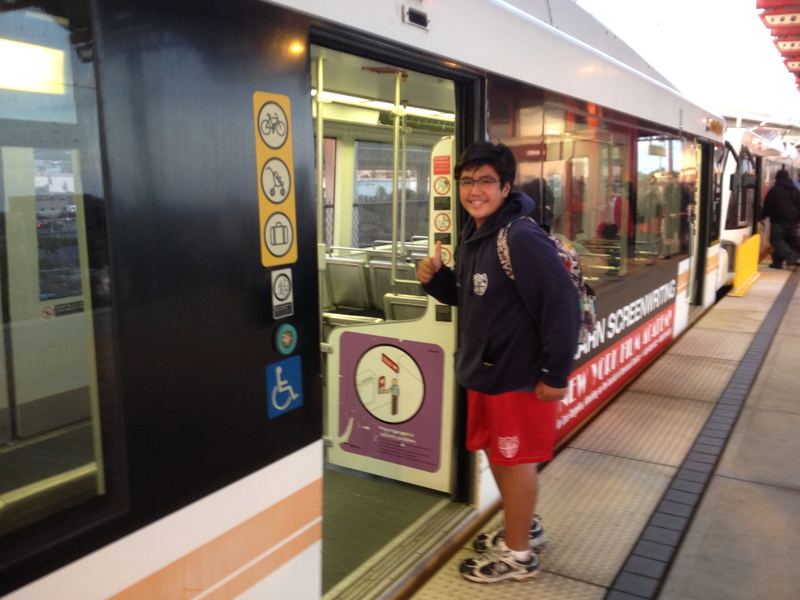 JP is one of many students who rely on Metro to travel to school and around the region. Photos by Cris Liban/Metro. Although Metro has programs to help parents and kids as they head back to school, many parents often still feel intimidated by the prospect of sending their kids off to class via transit. I contemplated for a little while on this article and have come to the conclusion that I needed to write it. It was a request from a colleague, Jody Litvak, whose kids grew up using transit. Jody’s three part post from a couple of years ago has a lot of great tips on getting students to school on transit. Well, it is back-to-school time again, an appropriate time to reflect on what Metro can do for your children. I ride transit every day, and the significance of Jody’s request didn’t really dawn on me until I started looking around. What seems to be innocuous to me has to be highlighted for others. I happen to live two blocks from a transit stop. My son JP attends a school that is only two transit stops away and transit has been one of my family’s choices to take him to school. We live in Los Angeles and it is almost always sunny and fun to walk, bike and use transit. As the environmental guy for Metro and with all of these great things going for me, I cannot help but sound biased. But I’m not. I am not going to convince you to get your kids and yourself out of your car and switch to transit. I will, however, try to provide you with information that will encourage you to try this great system we are expanding. As I wondered what my point of view would be able to offer, I thought hard about my experiences riding transit with my 12-year old son: the countless hours we spent – sometimes with my wife – going to different places around the city. We have been privileged to visit many parts of the world. And true enough, in the majority of those cities transit has been ingrained in people’s psyche by choice or by necessity. Riding public transit within those cities is second nature. Perhaps that is why I am so blessed to have a child who is more excited to ride transit wherever we go, locally and elsewhere, than riding in a car. Did I tell you that we started when he was just about three years old? I reflect on this picture as my son has become a leader and example at his middle school due to his use of transit. During field trips, he has often led his class in selecting the nearest station to catch the bus or train, buying tickets and showing them how to use NextBus and the Metro system as a whole. •Taking transit encourages my son to walk and fill-in the recommended 22 minutes of daily physical activity; an opportunity for him (and my family) to exercise. •Independence and confidence by riding transit builds character and introduces him to a Los Angeles who he may not otherwise know or meet. 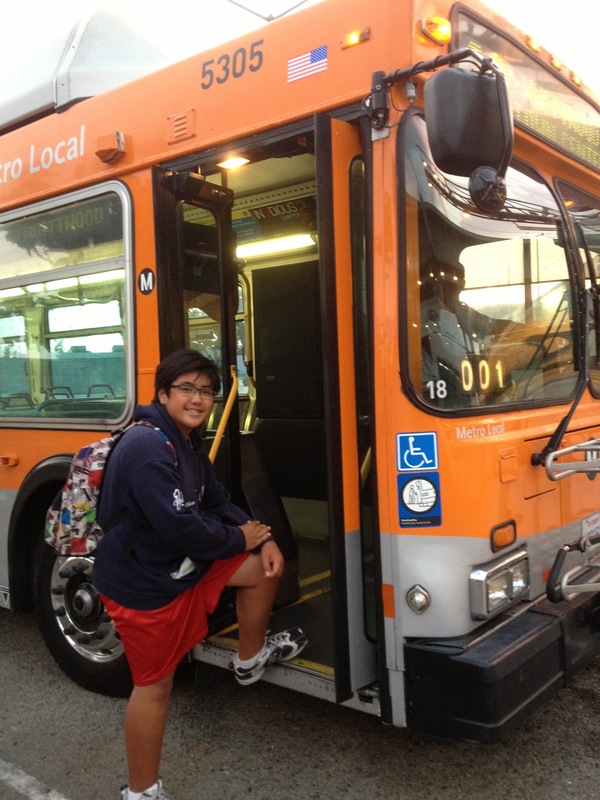 •Riding transit saves money compared to driving; spare change that he knows I put in his 529 (College) Plan or his Teen Savings Account as reward for excelling in school or doing chores at home. •Re-thinking about the value of driving a car; looking at the car more as another transportation option rather than a definition of what he will be as a person. •Time-saving and less stress as he is able to do his homework (and I get to answer e-mails) while being shuttled around by Metro bus or rail. We are in the midst of a great transit transformation in Los Angeles. My son is excited that he will be able to go farther faster in the very near future. He will be in high school next year. He is already thinking of one day independently meeting his friends at the nearest bus stop or rail station, and walk to where they need to hang out. So fun! it would be nice to have a direct connection from north Hollywood station to csun…. Love the article Cris. My kids also used transit as a choice to get to school during high school and that has continued as they attend CSULB and now use Long Beach Transit and BART and MUNI at San Fran State to avoid those stiff parking fees!! We also love using transit when we travel and cant remember the last time we rented a car.